We all know the music inside and out. Forward and backwards. We hear it on television commercials. It bleeds through shopping center speakers. And, of course, throughout nearly every dance studio this time of year. My Nutcracker challenge to you: Take some time and HEAR the score. Guilty, I allowed such comments to slip from my breath at times. Tiring of the gloomy heaviness I felt surrounding Nutcracker season, I looked for a new focus for these parts that I had rehearsed and performed for hours and years on end. I started to listen – REALLY listen – to the music. The Nutcracker ballet is scored for a large orchestra, so I decided that my dancing should live up to its grandiose size. The music. Like a delicious layer cake. 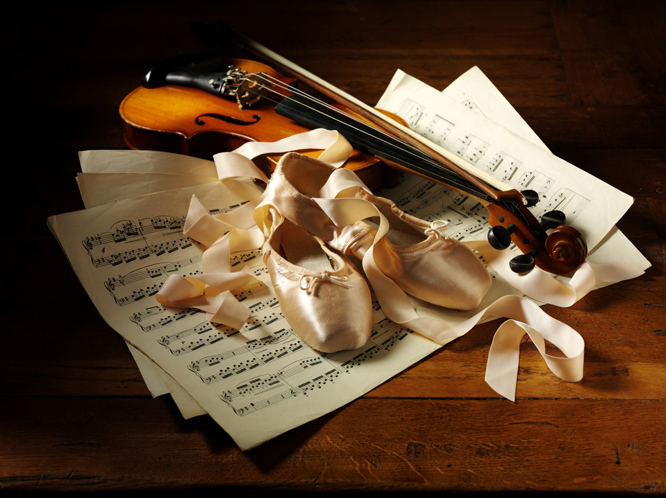 I began to hear the many layers within the score picking out various instruments that I could mimic in my dancing. You’ve probably had it said to you, feel the music. Be the music. Musicality is what I am talking about. This is my Nutcracker challenge to you: Take some time and HEAR the score. See if you can detect any musical nuances that perhaps you have never noticed before. Then ask, yes, demand more from yourself by playing with the music and the timing of your steps. Feel the music. Truly feeling a composition within your soul and not focusing so much on counting will free up your quality of movement. The music has so much more depth than your basic 1-2-3, 1-2-3 waltz. Possessing this kind of heartfelt emotion in your dancing will no doubt set you apart from the rest. Work on syncopation. When you hear a drawn out violin cord or a beautiful strum on the harp, mimic the sounds you hear in your steps. Stretch one movement out until the last moment and then quickly catch up to the next. This will add great excitement to your dancing. Use accents. Hear a drum. Be the drum. Moments such as this are placed into the score for a reason, so allow your audience the see and feel the impact you impose on them with such moments and movements. All in all musicality is yet another important part of your training toward becoming the best dancer and artist you can be. Nutcracker season is the perfect time to accept this challenge and experience something new within your dancing.